In May 2016, Kinner secured over $97,000 in financing from Gorham Savings Bank. 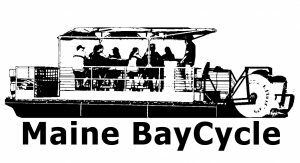 He purchased the boat, drove it across country and launched Maine BayCycle in early June 2016. 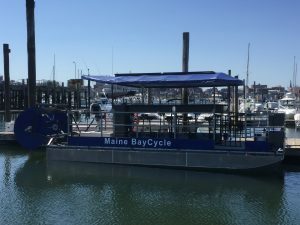 Maine BayCycle offers 90-minute tours of Portland’s waterfront, giving riders an opportunity to see the city from water level. Guests can pedal as hard or easy as they want to they’d like, and are welcome to bring refreshments aboard. 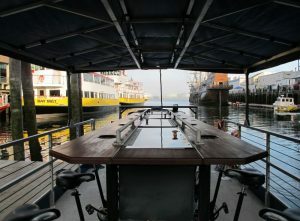 They also host birthday, bachelorette and business team building events. Kinner continues to work with Harriman, as they review his first season in business and find ways to grow and improve the business. For more info on this unique business, visit their website or follow them on Facebook.